Prepare yourself to transform into a divine hero and slaughter hordes of enemies, Yoozoo’s MMOARPG Era of Celestials is now available on the iTunes Store and will be available on the Google Play Store from Wednesday the 8th. 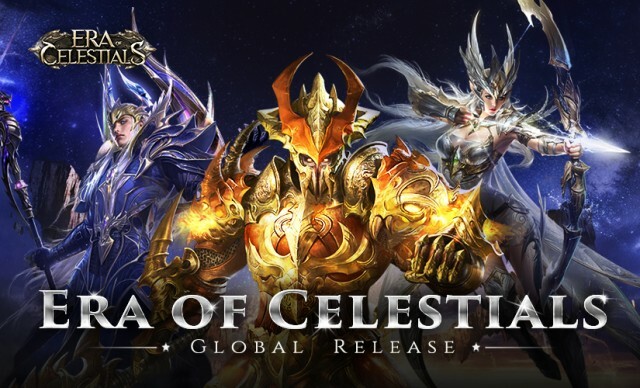 A recent hit in China, Era of Celestials is now ready to take on the rest of the world as a part of the growing trend of MMOARPGs that are building in popularity. Become humanity’s last hope as a champion chosen by the Celestials themselves. Defend Celestial City from the encroaching invasion and embark on the Path of the Vanquisher to gain both power and prestige. Adorn yourself with a huge variety of equipment to make use of the game’s stunning visuals.  Unseal and transform into different Celestials, become an invincible killing machine.  Collect and bond with Sprites to boost your combat power.  Engage in a variety of PvE modes including Boss Hunt, Dragon Slayer, and Story Instance.  Battle your friends in PvP in the 1v1 Showdown mode, as well as large-scale multiplayer modes. Head over to the iTunes Store now, and the Google Play Store from August 8th to show your divine power. Keep up with the latest news on the official Facebook page.